In keeping with the Earth Day theme today, here are some more ways to get involved - through education - from local food advocacy group Just Food. Garden Planning: April 25, 1-3pm Hattie Carthan Community Garden 654 Lafayette Ave at Clifton, Bed-Stuy, Brooklyn And check out Just Food board member and La Familia Verde Garden Coalition member Karen Washington talk about turning a vacant lot into a thriving community garden at Mayor Bloomberg's new volunteerism project, NYC Service. What step will you take this Earth Day for food justice?! Share your commitments/ideas. Volunteer with us this Saturday, APRIL 25 at Prospect Park. 10am-2pm @ Prospect Park Grand Army Plaza entrance (2/3 to grand army plaza). Join us in fulfilling the YES WE CAN Volunteer Challenge as part of Hands-on New York Day! Bring your closed-toe shoes and long pants and do some weeding, path edging, sweeping, and general clean-up. RSVP by emailing brooklyngreen@gmail.com and let us know the number of people you plan on bringing. Greenmarket Head to the Union Square Greenmarket (or another one in your hood that's open on Wednesday) and get all your ingredients and make a local dinner. Click here to see all NYC Greenmarkets. Search on Goodsearch.com. If you can't resist combing the internet for the latest developments of Miley Cyrus' career, try using this Yahoo-powered search engine that donates a penny per search to your favorite environmental cause. Support Local (and sustainable) if you're a BK resident. Pop into 3rliving and help them celebrate their 5-year anniversary and make a $1 donation to their recycling services they provide the community. Or pick your favorite mom and pop (sister or brother) in your neighborhood and support them. Go Outside and sit in the park. Give to your favorite local charity. There are so many great green groups in NYC. Our YES WE CAN VOLUNTEER Challenge post has a list of organizations worthy of your support. Plastic-free for the day. Don't purchase or take anything new that's plastic, from the produce bag you grab for at the grocery store to a bottle of Vitamin water. Check Out the myriad of Earth Day events in NYC. Check the Earth Day NY site or visit our partners at GreenEdge Collaborative NYC for event listings. Turn Off either your computer, your ipod, your TV, or all of the above for the day. Spread the News to others and remind them it's Earth Day and to do one good green thing. You could even forward them this email. We agree with Grist that Earth Day is everyday, but don't quite agree with their Screw Earth Day concept. One has to start someplace. Just do one thing and have a great day. Stay tuned for the next challenge. . .
Live in Brooklyn and not sure where to get things like biodegradable trash bags or organic linens? 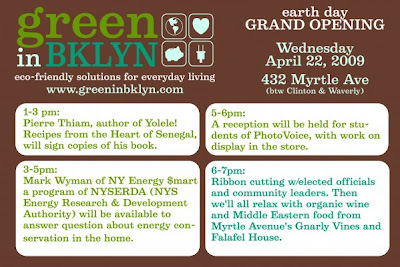 Now there's one shop that carries it all, Green in BKLYN and they're having an Earth Day grand opening today. I wish I could make it, 'cause it looks like a great place to connect with other green-minded Brooklynites. I'll be sure to bike on down there soon to check out their eco-friendly merch and chat with the Clinton Hill locals about their new biz.